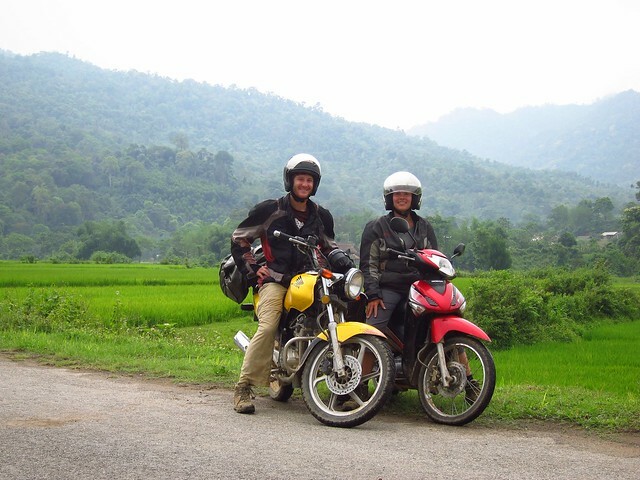 Before visiting Southeast Asia, we weren't big motorbiking enthusiasts; in fact, Claudia's motorbiking experience consisted entirely of a few anxiety-ridden hours in Europe many years ago, and mine consisted of crashing a small toy bike into a fence in Portland, Oregon in 2009. 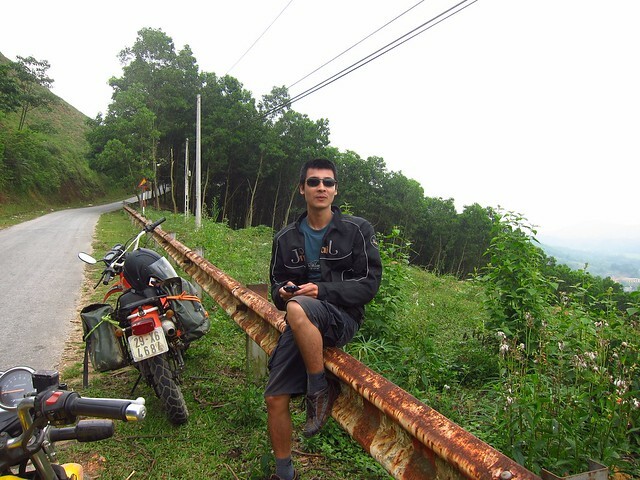 However, taking a multi-day motorbiking trip in the north of Vietnam is somewhat de rigeur, so we always had the idea that we might take such a trip. As we got closer, we began to hear more and more buzz, and we warmed up to the idea. 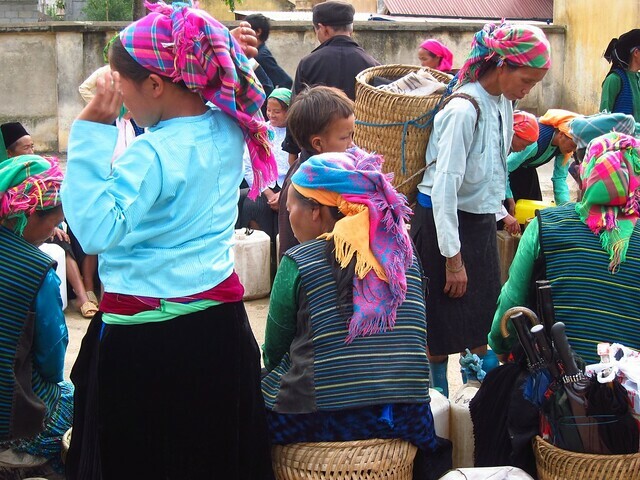 We're sure glad we did: our six-day trip through far northern Vietnam was more than a good introduction to the country, its people, food, language, and dress, it was also jaw-droppingly beautiful and a thrilling adventure for our introduction to the pastime. 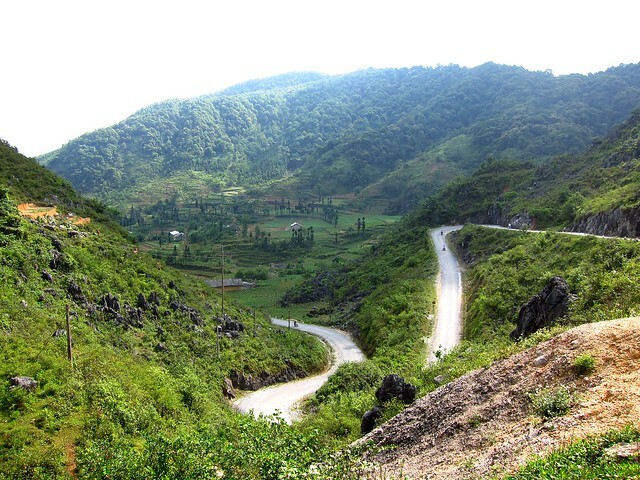 When we talked to people in Hanoi, the trip's jumping-off point, and to the few other tourists we came across along our route, we realized that we lucked out with our choice for our first motorbiking trip: many people said that it was the best loop in southeast Asia, and one group of seasoned Australian bikers, who had ridden all over the world, said it was the best trip they had ever been on. We met our charming guide, Hoa, who outfitted us in biking jackets, gloves, and helmets, and introduced us to our bikes, then it was off through Hanoi's crowded streets and into the country. Throughout the trip, Hoa was a capable and friendly guide, perfectly gauging our comfort and choosing our route and speed accordingly, and doing a wonderful job of understanding our interests, and translating for us so that we could have short conversations with the local people we came across. 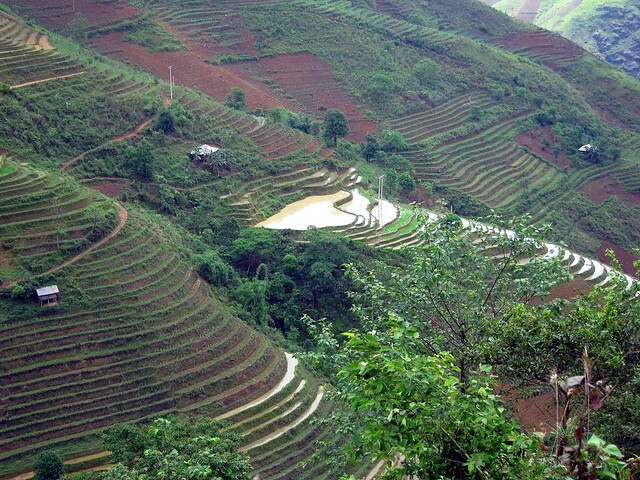 Our first two days involved straight and easy roads through the verdant farmland outside Hanoi up to the northern hub of Ha Giang. We saw a small pond full to the brim with white ducks, many people wearing the iconic rice hat and working in endless fields of rice paddy, and many fellow motorbikers transporting produce: cages precariously placed on the back of the bikes, containing enormous (live) pigs, ducks, and even dogs. 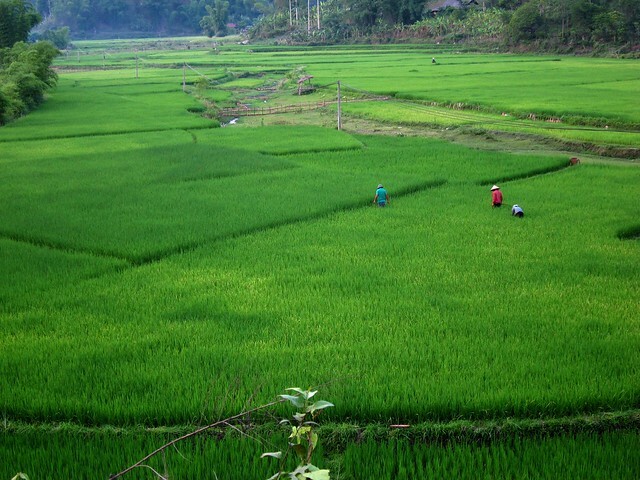 But most memorable was the bright green color of the rice paddies, a green that is so vibrant it's hard to believe it's natural. 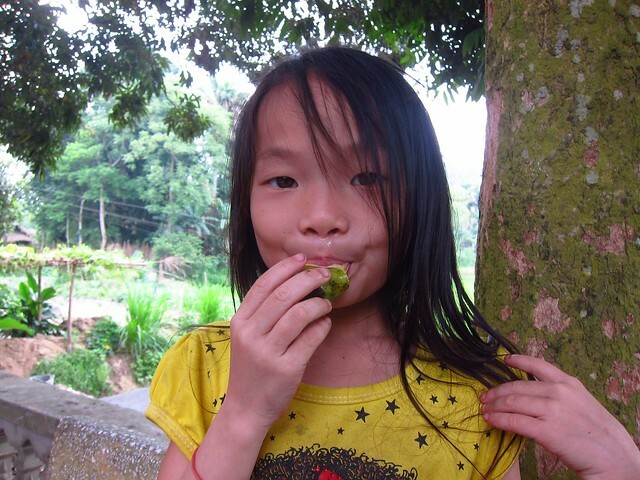 We also stayed in two charming homestays where we were given spartan accommodation of thin mattresses in a large shared room, but our best memories of these days are of the huge communal dinners shared with the friendly and outgoing families. We shared heaping bowls of rice, fresh grilled fish, savory-sweet pork in at least two or three styles per meal, delicious stewed bitter greens, and an omelet for good measure, all dipped in pungent and delicious fish sauce, the Vietnamese national condiment. Add to all that a local, homebrewed rice wine of which everyone in the family insists on sharing a shot (and one more...and one more...and this is the last one...and one more "last one"), and these two meals were certainly some of our favorites from all year. 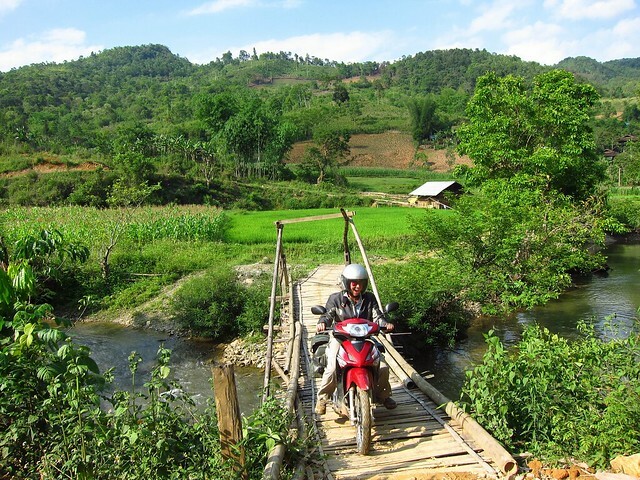 The last three days saw us attending a lively and colorful Hmong market, seeing even more breathtaking scenery, and making a half-dozen thrilling and precarious crossings of streams by rickety bamboo bridges. We also took a leisurely boat ride on Ba Be Lake, Vietnam's biggest lake and the center of a popular national park. While the scenery was incredible, as usual for our trip, it was the interactions with people that we'll remember the longest. 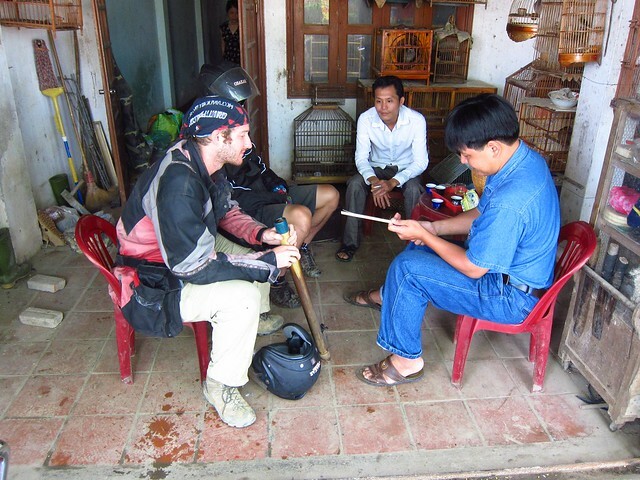 Every day we took two or three breaks during the ride for a cup of tea, Vietnamese coffee, and a puff from the traditional bamboo water pipe (yes, it's just tobacco! ), often sharing a table with a group of older Vietnamese men, and invariably surrounded by many sonorous caged birds. If we were hesitant motorbiking novices before, you can fully induct us into the sport now. We loved the feeling of the wind in our faces, and the connection to our surroundings: not being enclosed in a car, bus, train, or plane means that we could look at the scenery all around us (at least while keeping one eye on the road). I think that a bicycle is the perfect way to see a city, allowing you to move quickly through it, but affording you the opportunity to stop, linger, take pictures, and to experience the city on a human scale and pace. If that's true, then motorbiking must be the perfect way to experience the countryside: it's more open and adventurous than a car or bus, making you feel much more connected to and integrated into your surroundings, but you can cover much more ground in a day than if you were bicycling or hiking. Great Adventure! 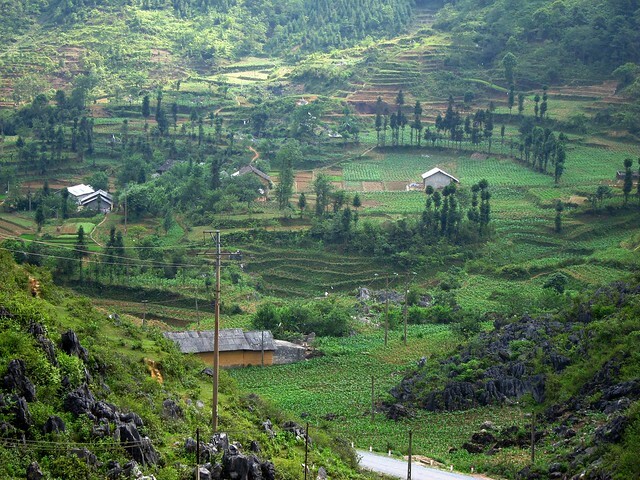 How are you finding the reception of Americans in Vietnam? We didn’t really experience any bad attitudes toward Americans. We heard lots of stories of people being treated rudely or ripped off (especially for Halong Bay tours), but we weren’t too overwhelmed by it, and didn’t feel like it was particularly because of any historical ties. Such beautiful and colorful photos! And the food….yum….